Shoe Horn - Plastic 3 1/2"
Our Silver 3.5 inch metal shoe horn makes it a lot easier to put on your shoes. No more struggling to put on tight shoes. The long part is tapered to fit comfortably in your hand, while the end is contoured to fit easily into the shoe. There is a convenient hole at the top to hang it up for storage. This Metal Shoe Horn is 3.5". Makes it easier to put on shoes, and it will last a lifetime. This Metal Shoe Horn is 3.5". Simple and efficient. This is the same shoe horn used in shoe stores. Our 3-1/2" plastic shoe horn makes it easier to put on your shoes. It is contoured to slide effortlessly into the shoe. No more struggling to put on tight shoes. Call for bulk pricing. Heel and Toe Savers help you walk steadily, and protect your boots and shoes from wear-and-tear. Made of polyurethane. Safe for most floor surfaces. Nails included for easy installation. Six sizes accommodate all shoes. Also available in Clear Plastic and Steel/Metal. Clear Plastic Heel Toe Savers. Walk steady with these boot and shoe protectors. Made of clear polyurethane, they provide sure footing and save wear and tear on footwear. Safe for most floor surfaces. Nails included for easy installation. Six sizes accommodate all shoes. One pair. Available in Black Plastic and Steel/Metal. Shoe Horn - Plastic 7 3/4"
Shoe Horn - Plastic 6 1/2"
Our 7-3/4" plastic shoe horn makes it easier to put shoes on. It has a slightly squared end that is contoured to fit into shoes effortlessly. No more struggling to put on tight shoes. Available in Light Blue, Navy Blue and Yellow. Our plastic shoe horn makes it easier to put on shoes. It is contoured to slide easily into the shoe. There is also a hole at the top for convenient storage. No more struggling to put on tight shoes. Available in: Black, Cobalt Blue, Glitter Black, Glitter Blue (last one shown in photo), Green, Red and Yellow. Our Professional Silver metal shoe horn makes it a lot easier to put on your shoes. No more struggling to put on tight shoes. The long part is tapered to fit comfortably in your hand, while the end is contoured to fit easily into the shoe. There is a convenient hole at the top to hang it up for storage. This Professional Metal Shoe Horn is 7.5". Makes it easier to put on shoes, and it will last a lifetime. Shoe Horn - Plastic 9 1/2"
Metal Heel and Toe Savers. Walk steady with these boot and shoe protectors. Made of steel, save wear and tear on footwear. Extra long wearing. Not recommended for hardwood floors. Nails included for easy installation. Three sizes accommodate all shoes. One pair. Also available in Clear Plastic and Black Plastic. Our 10" shoe horn is made of high-grade plastic, and are durable and very smooth around the edges. Makes putting your shoes on much easier. Measures 10 inches long.Note: Using a shoe horn will help prolong the life of your shoes by keeping the heel from breaking down each time you put your shoes on. Note: Using a shoe horn will help prolong the life of your shoes by keeping the heel from breaking down each time you put your shoes on. Our 9-1/2" plastic shoe horn makes it a lot easier to put on your shoes. No more struggling to put on tight shoes. The long part is tapered to fit comfortably in your hand, while the end is contoured to fit easily into the shoe. There is a convenient hole at the top to hang it up for storage. Tacco Bag Stop is put under the strap of a hand bag where it sits on your shoulder and is invisible when in use. Self-adhesive. Fits all sizes. 1 pair. Our heel protectors reduce wear at the heel or toes. 2 pair per package. One mens Pair and 1 women's pair. They have adhesive on the back and includes the tacks for easy installation. Barge All Purpose Cement - Sm. 3/4 oz. Barge All Purpose Cement - Lg. 2 oz. Fiebing's Fresh Feet eliminates offensive footwear odors. Simply spray inside shoes, boots, or sneakers. Also great for lockers and gym bags. Metal Army Rim Horseshoe Heel Plates for Shoes & Boots. These heavy-duty heel plates are great for bikers, work boots, hiking boots, or any boots or shoes that need extra heel protection. Threaded nails included. 1 pair. Available in sizes: 10-11, 11-12, 12-13 and 13-14. Barge All Purpose Cement. Ready-to-use for rubber, wood, leather, glass, cork, metal and more. Retains flexibility and never becomes brittle. Great for shoe repair, leather goods, weather stripping, car doors, windows, replacing tiles & wall brackets and much more. Moneysworth & Best Travel Shoe Bag stores your shoes, handbags, and more while traveling. Made of soft cloth to protect shoes in luggage and totes, with a draw-string closure. Holds one pair of shoes. Look No Further for High Heel Protectors. Durable, Tough, and Sustainable! StiloGuard® is specifically made to give you the freedom to walk with ease and confidence on grass. Unlike other products that attach firmly to the heel, our product works by rolling naturally around your heel. By giving you more stability by dispersing your weight evenly through the heel guard, you can walk on grass and soft surfaces without worrying about sinking or tripping. And it does not damage the heel! Special coating for hard surfaces. Please call for pricing! Take the guess work out of buying. Save money. You only need to buy one size! Affordable! The more you buy, the more you save. We offer the widest variety of quantity, from a single pair to bulk sales of 500 or more. Our patent-pending rolling design takes the stress out of walking on uneven surfaces. Hands free attachment and detachment, without bending over or raising your foot. Attaches to any stiletto or kitten heel up to 1/2″ thick. Protects your high heeled shoes from damage and getting stuck in the grass. 100% Recyclable, so there is no guilt about disposing your Stiloguard®s after you are done! Shoe Goo - 3.7 oz. Kelly's Professional Grade Cork Renew - 2.4 oz. Shoe Goo adhesive and sealant permanently fixes practically any shoe. Works on leather, rubber, vinyl and canvas. Stronger than glue. Can be used to seal and protect boots, reattach broken heels, and much more. Works on all types of footwear. Available in Black and Clear. Kelly's Professional Grade Cork Renew protects, seals and waterproofs any cork surface. The non-toxic formula seals cork bed sandals, and prevents them from cracking and flaking. Dries clear. Comes with easy-to-use brush applicator. Clear Penguin Shoe Goo adhesive and sealant provides permanent repair for all leather, vinyl, rubber and canvas shoes, boots and sneakers. Secures loose soles, repairs damaged heels, and coats frayed shoelaces. Revives worn shoes. It dries to a waterproof, flexible rubber. Use it to fix waders and boots without breaking or cracking under stress. Can be used on flip-flops, cowboy boots, dress shoes, all sports shoes, flippers and much more. 3.7 oz. Available in Black. Premier Soothing Foot Powder - 7 oz. Premier Soothing Foot Powder keeps feet cool and dry. Refreshes feet, providing comfort to tired, tender feet. Regular use helps reduce foot odor. M&B Odor Stop refreshes and deodorizes all shoes. Odor Stop may also be used to deodorize gym bags, golf bags, and other areas where moistures and perspiration persists. M&B's Cool Mountain Mist formula will keep your shoes and bags smelling fresh and clean. Boot Toe Saver Caps add life to any work boot by protecting the toe area from wear-and-tear. The boot saver is a flexible piece of sturdy synthetic material which adapts perfectly to the shape of footwear to protect the leather cap. They will not mark floors, and are resistant to cold, heat, water, friction & chemicals. The toe caps also increase protection against electrical shock, and provide improved compliance with safety standards. Package includes two Toe Caps, specially formulated glue and sandpaper. Easy to apply. One size fits all. Made in U.S.A. Available in Black, Brown and Tan. 23 inch Long Plastic Shoe Horn is contoured for ease of use. No more bending over to put on your shoes. Made of sturdy plastic with a hook at the top and a hole for easy storing. 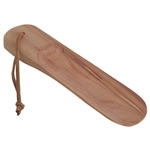 This handsome wooden handled shoe horn is a must for putting on shoes without damaging your shoes. Wooden handle with a smooth chrome piece for easy sliding into your shoes. 12 inches long with a rawhide handle for easy storage. Just for KiiX heel protectors protect the back of your heels without changing the look of your heels. For shiny heels (ie. patent leather, metallic, a shiny finish). Protect heels against scuffs and scrapes. Easy to use - adjusts to heel size using perforations. Give your heels a fighting chance! Toe Armor - 2 oz. Boot Hooks make it easier to pull on western boots. Simply insert the hooks into the leather loop on the side of your boot and pull up. Made of solid wooden handles with metal hooks. Measures 7 3/4 in long. Grip-N-Shine allows you to shine shoes without getting polish on your hands. Easily adjustable to fit most shoes. It will stretch the leather to ease buffing. Constructed of light-weight, durable plastic. Toe Armor boot & shoe protector extends the life of boots and shoes by providing a rubberized coating to worn out areas. It's easy to apply and comes with everything you need - sandpaper to clean and roughen the area to be treated, a stir stick to mix the product before use, and a dauber to apply it to the shoes or boots. Available in Black and Brown. PLEASE SELECT COLOR BEFORE ADDING TO SHOPPING CART. Baseball Glove Lacer. Lace up your own baseball glove with this genuine rawhide lace. Comes complete with an easy-to-use threader. 72" length. Comes in Black, Dark Brown and Tan. 30" Extra Long Plastic Shoe Horn is contoured for ease of use. No more bending over to put on your shoes. Made of sturdy plastic with a hook at the top and a hole for easy storing. Colors vary. Could be Black, Green or Blue. Our flexible 13 inch Shoe Horn with Flexible End features a spring loaded flexible head that helps people with a limited range of motion slip into shoes without bending, bruising heels or crushing the backs of the shoes. Long handle shoe horns are handy for people with arthritis, hip or knee replacement, general problems bending and reaching down because of broken limbs, etc. The long handle makes it easier to put on clothing and shoes without harmful flexing of the hip or knee. PLEASE SELECT COLOR BEFORE ADDING TO SHOPPING CART. Shoe & Sneaker Sweetner + eliminates odors on multiple surfaces such as shoes, skates, gym bags, lockers, sports equipment and more. Our flexible 24 inch Shoe Horn with Flexible End features a spring loaded flexible head that helps people with a limited range of motion slip into shoes without bending, bruising heels or crushing the backs of the shoes. Long handle shoe horns are handy for people with arthritis, hip or knee replacement, general problems bending and reaching down because of broken limbs, etc. The long handle makes it easier to put on clothing and shoes without harmful flexing of the hip or knee. Metal Shoe Horn 23" long. Designed to satisfy the travel accessory needs of men and women whether on a business trip or vacation. Products offer high performance, stylish design and rugged durability. A Stitching Awl is ideal for sewing leather, canvas and similar materials. Comes with two diamond-pointed needles - 1 straight and 1 curved. Also includes 1 spool of 180 yards of white thread and a wrench. These Long Boot Hooks make it easier to pull on western boots. Simply insert the hooks into the leather loop on the side of your boot and pull up. Made of solid wooden handles with metal hooks. Measures 12 in long. The large Western Boot Jack allows you to remove western boots easily. Felt pad prevents scuffing and keeps your foot from sliding. Made of solid wood. 11 1/2 " long, 5 1/2" wide. Shoe Gear High Country Heated Shoe and Boot Dryer gently blows warmed air into footwear for fast drying. The arms extend 8" for use on high boots. Can also be used on gloves, ice skates and ski boots. Compact, foldable design for easy storage. Adjustable timer with auto-shutdown. Won't harm footwear. Dries most shoes and boots in 1-2 hours. Quiet, durable motor. This deluxe shoe valet is constructed of aromatic red cedar with a shoe support and hinged top where you can store your shoe care products. Shoes are warm, dark and damp — the perfect breeding ground for germs that can infect your feet and make them smell. More effective than sprays and powders that can leave a toxic residue, ShoeZap® is the fast, easy way to kill fungus and bacteria that cause Athlete’s Foot, Fungal Nails, Foot and Shoe Odor, Diabetic Infections and more. Keeps shoes ‘microscopically-clean’, more hygienic and safe to wear. One size Sanitizer fits all footwear styles and sizes, so ShoeZap® will disinfect every shoe in your home and family — Men’s, Women’s, Teens and Children. Shoes are the only article of clothing we never clean — until now. UVC germicidal light kills fungus and bacteria that thrive in shoes and cause Athlete’s Foot, toenail fungus (onychomychosis), foot and shoe odor, skin infections and more. Helps keep shoes ‘microscopically clean’, hygienic and odor-free, without the use of toxic chemicals. 15-minute automatic-off time cycle. Both a product and service healthcare professionals can offer their patients suffering from these common foot conditions. Box Contains: 2 Shoe Sanitizers (1 pair), 2 Protective Shoe Bags, User Manual, A/C Power Adapter, UV Warning Card & Product Registration Card. The Three Stars Electric Shoe Polisher allows you to shine and buff all types of shoes quickly and easily in the comfort of your home or office. The dual buffers allow you to polish and buff. Easy one-touch on/off control switch. Power 95 watt motor provides years of dependable service. Comfortable 31" stand-up operation.